The purpose of this document collection is to allow students and teachers to develop their own lines of historical enquiry or historical questions using original documents on this period of history. Students could work with a group of sources or particular document series which identifies a certain theme. Of course the sources offer students a chance to develop their powers of evaluation and analysis and support their course work. Teachers may wish to use the collection to develop their own resources or encourage students to ‘curate’ their own ‘exhibition’ of the most significant documents on the topic. Finally, there is an opportunity to consider film sources as interpretations of these events in relation to the documents by following the link to Pathé provided here. Independence 1918-47. In this unit students are required to carry out their historical enquiry and also make links between modern representations of this period of history. The impact of the Second World War on the relationship between Britain and India economic and political imperatives in Britain and India driving independence; role of Mountbatten; the decision to partition and the immediate consequences of that decision. End of Empire Key Question 3: How well did Britain deal with the issue of Indian independence? 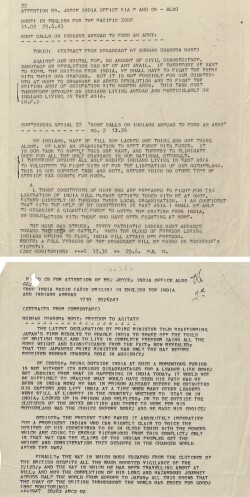 The documents in this collection can be used to support this unit. The end of the British Empire in India in August 1947 resulted in the creation of two separate states of India and Pakistan. The division was based on religious lines, a Muslim majority in Pakistan and a Hindu majority in India. Pakistan itself was split into two parts in the east (East Bengal, which became Bangladesh in 1971) and in the west (western Punjab). This event was to result in the biggest mass migration in history. Over 18 million people migrated to join their particular religious majority. At least a million people died in communal violence in the process. There is much historical debate as to why partition was accompanied by so much bloodshed. Was it related it to the speed at which the British got out of India? 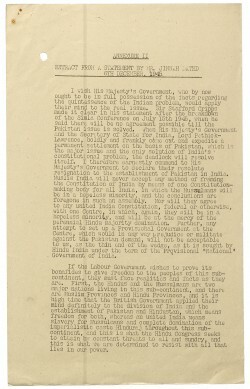 Clement Attlee’s new Labour government in 1945 was keen to grant independence, was this related to the fact they could not afford to support and finance an empire after the war? 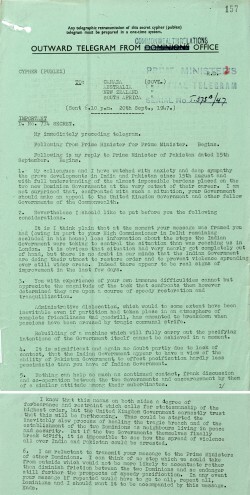 The British promised to leave India by July 1948, but the Viceroy Louis Mountbatten moved this forward to August 1947. 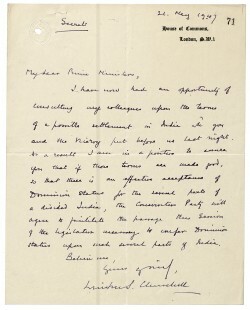 Sir Cyril Radcliffe headed the boundary commission which draw up the border between India and Pakistan. According to historian Ayesha Jalal, ‘it was rather an arbitrary line, which in some instances cut villages into two’. It seems that there were not sufficient plans for the administrative operation entailed in partition. The British left a situation of civil unrest and religious tension which was very destabilising for the new governments. Kashmir is still an unresolved issue and remains a source of conflict between India and Pakistan. 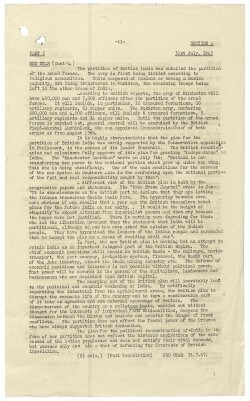 This document collection relates to India and the struggle for independence and the road to partition 1939-1947. 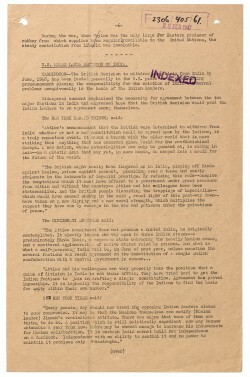 It covers some of the key aspects of this period, for example, how the Second World War impacted on India’s relationship with Britain, the civil disobedience campaign as well as the differences between Indian politicians Jinnah and Gandhi. 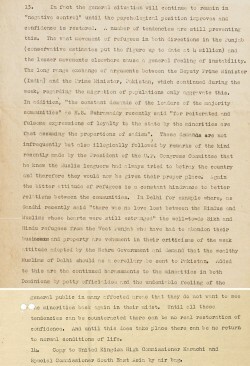 Other documents relate to British government policy on independence and various conferences held on the matter. 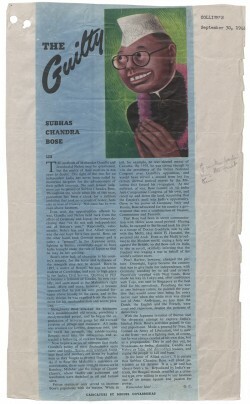 Further documents explore the immediate impact of partition including its effects on the Sikh population. The documents come from a range of British Government departments. 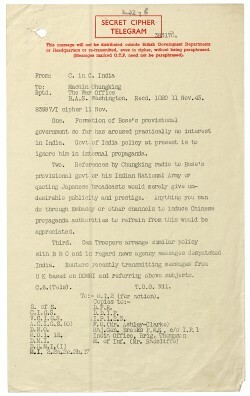 These include documents from the Prime Minister’s office (PREM), Cabinet Papers (CAB), Foreign Office (FO), War Office (WO), Dominions Office (DO), and the Ministry of Information (INF). Finally the collection includes contemporary articles by the British and foreign press.